August 10, 2011 (HILLSIDE, NJ) — WizKids/NECA announces the manufacturer sell-out of their most recent set, DC HeroClix®: Superman. 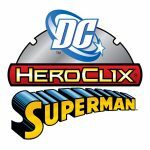 WizKids’ entire inventory of DC HeroClix: Superman, releasing September 28th, 2011, has been completely sold to distributors worldwide. The DC HeroClix: Superman expansion will feature more than 50 figures in standard five-figure boosters. Celebrating over 70 years of history, Superman brings all of the action and amazing power that only the Last Son of Krypton can deliver, and where Superman treads his greatest villains and allies cannot be far behind! Popular sub-themes in the set will include: All-Star Superman, the World of New Krypton, the Legion of Super Heroes, the exciting and pivotal Flashpoint mini-series and more! The DC HeroClix: Superman standard booster product also features an all new, in-pack Buy-It-By-The-Brick Robot Superman figure! For the first time ever, the Buy-It-By-The-Brick figure will be available in the brick itself contained within an unmarked 6 figure booster! If you are still looking for Superman bricks/cases contact my office at 217 864 6485 or contact me directly via this blog. My corporation Bradshaw Consulting, Inc. has a store that provides gaming products to the area as well as mail order. My store still has Captain America boosters available but at a very limited quantity. The website for The Lair is under construction and I plan to announce its re-launch soon. Bradshaw Consulting, Inc. has been providing quality content on the internet for over 10 years. Providing services such as web design, web hosting, copy, search engine optimization, programming and management skills designed to increase the companies bottom line. A wholly owned subsidiary of the National Entertainment Collectibles Association Inc. (NECA), WizKids/NECA is a New Jersey-based game developer and publisher dedicated to creating games driven by imagination. The HeroClix brand is the most successful collectible miniatures games on the market today, with over 100 million miniature game figures sold worldwide. For additional information, visit www.wizkidsgames.com. Back in April, 2011 I planted my first Asian pear tree, Pyrus pyrifolia, and until now I have had great luck weathering things,(no pun intended). As my luck goes, the year I plant my tree is the year the Cicadas show up and attempt to destroy the newest addition to my yard. With a little help, (some cheese cloth to protect it), my Asian pear tree won against the Cicadas! No sooner had I won that battle when the next enemy was up and ready to fight! The Japanese Beetle….. This small, ornate beetle has turned out to be a more dangerous foe than I had originally thought. I went out every morning and dutifully picked off the beetles. I also used a little trick I learned last year while protecting my blueberry bushes from this evil foe. You take a bowl of soapy water and hold it under the branch and shake the beetles to the water. They are unable to get out and they drown. If you leave their dead bodies around the plant, it helps to deter other beetles from coming near. This is a bit time consuming, but allows you to avoid using a pesticide. What makes these nasty bugs so bad is their multistage existence. They start in the ground as a grub feeding on the roots of your grass where they burrow deep to survive the winter. Around late June to July, and after they have killed your grass, they emerge to feed and breed. They love the leaves of soft wood and fruit trees/bushes and the female will land first in order to eat. Once there, she will send off a pheromone which attracts any male beetles within a 5 mile radius. They will come to her location, eat ,and then breed with her. Once the female is ready to lay eggs, she will drop to the ground and implant her larva, (future grubs), which start the cycle all over again. After some time, I got a little lazy in pulling off the beetles each day. I was only seeing one or two beetles per day and there were no more than a few even if I skipped a day of removing them. I had a short 2 day trip and I was not overly concerned with the beetles at this point. After all, we had survived those nasty cicadas! However, to my dismay, when I returned home the tree was 100% stripped of all her leaves! I was utterly devastated! I should have taken a picture right away but I was too crushed to even look at her. After so much hard work, I felt that I had failed. My little Asian pear tree had survived the planting, cicadas, and the horrible heat but after all of this, the Japanese Beetle prevailed. Shortly after this incident, it was time for us to go on another trip. I decided to just deal with the tree when we got back as I was sure I would be digging her up and starting over. To my surprise, when I got back a few days ago from my trip, the tree was doing better than ever! I have to credit this to the quality of the plant. I have had other experiences with plants that have not gone as well. Last year, when I purchased plants from Walmart, (which was a bad idea), I found that they were inexpensive, but I lost half of them. One of the plants purchased at Walmart did not even make it to winter and the other died during winter. I had to replace these plants, so they did not end up being so cheap after all…. I did a great deal of research before purchasing more plants. In response to my bad experience with cheap plants, cost was not the biggest deciding factor. I wanted a company that had quality trees and plants and a knowledgeable staff to assist me, ( I had many questions). The company that I settled on was a place called Clifton’s Nursery. They had a nice website, reasonable prices, and when I called, they were happy to answer my questions. Also, this was the only place that had my Asian Pear tree in stock! The company is in California so I was a bit worried about shipping but it was still affordable even with the shipping included and I have had absolutely no regrets. When my little Asian pear tree arrived, I wish I would have taken photos but I was so happy to have gotten my tree I did not even think about it. It came so nicely wrapped and even had instructions on its care. I will say, going forward, I plan to purchase everything from Clifton’s. I still need to replace my blueberry plants that died and my kids really want an Apple tree. I will keep you posted when we plant some more this fall!! The Northeast Community Fund, located in Decatur, IL, is a non-profit agency that strives to help as many families as possible by providing much needed food each and every month. They have a Facebook page and would love a friend invite. The store is located at 825 N Water Street in Decatur, Illinois 62523 This astounding organization provides support for over 1600 families per month and have already served 730 new families in 2011. The work they do is quite impressive and they make good use of their limited resources! This organization not only provides food to our local families in need, they also provide clothing, used furniture and many other living essentials. They have a free clothing room, which of course provides much needing clothing. 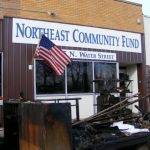 So if you have things just filling up your garage, please remember the Northeast Community fund. They take donations of clothes and household items everyday. However, the need for food is growing in the Decatur area. Right now, due to the over whelming response they are getting from families in need, non-perishable food items are urgently needed. They collect these much needed items every day from individual families and also through collections from churches, schools, and food drives. They need your help to keep their food shelves filled so that they can continue their ministry. If you have some can goods lying around your pantry or have a few minutes to stop by the grocery store, please consider grabbing a few items after work and dropping them off at their water street location. Your efforts will be greatly appreciated. Please, also take a few seconds to share this page using the social media links below and help spread the word! Thank you for your consideration! This past weekend we celebrated a combined 16th birthday party for Jacob Clark and Joey Bartmann. Most of the photos have been uploaded to Carmen’s facebook profile. The great photos were taken by Ted, Carmen’s step-dad and he did a fantastic job! The party was based on a Barbecue/cook-out theme with a pool, thanks to Carmen’s mom, Linda Hoppe. Carmen’s mother was nice enough to open her house up so we could have a pool party. Good food and great company is a very important thing and it was nice to see everyone together. The party was a great success and we all got to celebrate both Jacob’s and Joey’s entry into the driving years of life! Last year Bradshaw Consulting Inc. ran a promotion for one of it’s businesses at Castaloy.com. There was an overwhelming response to this promotion that awarded free cast iron repair rods. Over the weekend I had someone inquire about a list of all the free items or promotions that have been offered by Bradshaw Consulting Inc. I have also been asked by other clients to help promote their products via promotions or contests. In response to this apparent need, I have decided to create an area to list and promote these and other promotions within our group. This post will be updated often with current promotions and other special offerings. Please take a moment to bookmark this page if your interested in coming back to find out how to win free things. A free pound of alumaloy, an aluminum repair rod. A free year of web hosting at hostexa.com, winner may pick any package from the shared hosting section. Painted Feather Farms is offering a free breeding to Reserve World Champion, Superior Halter Stallion, Double Registered Sinatra On Ice. Win a free trip to Texas and a guest appearance on The American Garage. Enter to win a free box of Magic The Gathering! 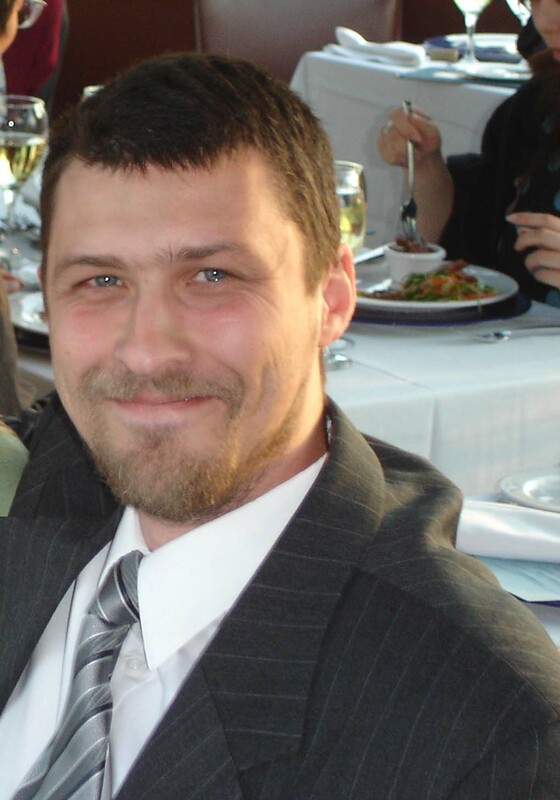 Over the past few months things have been very busy at Bradshaw Consulting, Inc. This is the reason why I have not posted many blogs over the last few months. While on a work related trip to Chicago I stopped at starving rock on my way back. I plan to post some pictures and my experiences during that 10 mile hike. Late last year we completely redesigned the corporate website while keeping the same logo and colors. A large number of my clients loved the items like logo and colors but I felt the website was becoming old and outdated. 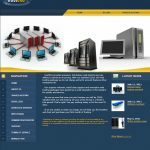 Earlier this week Hostexa, the web hosting division, also had its website redesigned to conform with the new design at Bradshaw Consulting. The company also went through its control panel being upgraded to the latest version of Plesk which was much expected. My goal is to release more content on this upgrade in the coming months. The company also got a complete overhaul of its billing system which went live this week. This also has many new features that will require some articles to better inform my clients of this powerful new addition to the services offered. One of the biggest tasks I face is the organization of all the web hosting companies I have purchased over the years. These companies have separate pricing, web design, services and before they were all handled via unique billing systems that ended up being inherited from the previous owner. Now all of these companies are located under one platform. This allows my employees to handle support and billing issues easier and with less time which equals better customer service and support. Now the website at Hostexa has been completed I added the hostexa profile page to the my projects section of this website. Description: Hostexa was formed in late 2000 as the web hosting division of Bradshaw Consulting, Inc. Serving its community and abroad for over 10 years they have provided quality web hosting with cutting edge technology. Cutting edge servers are used to support a robust range of services provided by the worlds leading control panels; cPanel and Plesk. Cicadas are nasty little critters. I guess it would not be so bad if they were not everywhere! 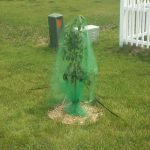 I had already not been looking forward to protecting my newly planted Asian pear tree from the Japanese beetles which should be here around July or August. Now I have found that I have to deal with the Cicadas this year as well. To me, Japanese beetles are horrific, but now I’m starting to wonder if the Cicadas aren’t even worse. The Japanese beetles will strip the tree of all green foliage which is pretty bad but Cicadas will actually cause damage to both the roots of your tree as well as the smaller branches. Cicadas spend about 13 years underground where they will eat the roots of your trees much like the larva of the Japanese beetles eat the roots of your grass, so it is understandable why they are so aggressive when they finally climb out of the ground. They have just a few weeks to find a mate and if female, to lay their eggs. The eggs are planted inside the bark of tree trunks and their branches. 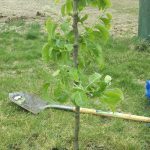 This can cause newly planted trees to require pruning or even worse, could cause the tree to die. The larva wiggle out of the tree after causing damage to the branches and then drop to the ground where they burrow and stay for 13 years feasting on the tree roots. Yuck! A few days ago I went outside and noticed I had cicadas all over my tree! I was mortified! The thought of losing my tree after all the work I have put into it did not sit well with me. I decided to purchase some cheese cloth so that I could cover up the tree and protect her. I have even found Cicadas on my rosemary bush! Despite the Cicadas, my Asian pear tree is doing pretty well. My first attempt at growing an herb container garden last year did well and it was a great learning experience. Most of the established plants were started from seedlings inside the house. I wanted to see if I could grow them from seed inside before spring and then move them outside. I lost a few plants but most of them made it outside. I planted a few herbs, like the dill and basil, late because we don’t have much use for them. However, we decided to go ahead and try some for the fun of it. I have to say that it was a lot more work than I had anticipated and I think going forward, I will just repurchase what does not survive the winter instead of trying to grow them from seed. I have found that it does not really save any money and the amount of work involved actually makes growing them from seed counterproductive. My chives were the one plant that actually did come back this year on its own, which was surprising because the pot had been left out all winter. The marigold plant was from Connor’s 1st grade class so I’m excited the plant is doing so well. Here is a link to my Plant photo album which contains some new pictures. As you all may know Mt Zion schools ended this past Friday the 20th. So we decided to pack up the car and head down to St Louis to enjoy the weekend. Jessikah is in the bucket seat while the boys are in the back, Connor on the right and Derrick on the left. Jacob is hiding behind me to the left of Jessikah. In this 3rd installment of our three part series, How to clean metals, we will discuss the proper way to clean stainless steel before using our product, Steelaloy. Steelaloy is a stainless steel rod used to repair steel without all the cost normally associated with other forms of repair, such as welding and brazing. Stainless steel is a happy medium between aluminum and cast iron. Steel isn’t as porous as cast iron and is less susceptible to corrosion. However, it is still not as resistant to corrosion as aluminum. Therefore, thorough cleaning and use of flux is highly recommended. As with Alumaloy and Castaloy, a clean cloth or rag is the only cleaning tool needed for a neat break. For a rougher break, we recommend using a wire brush or wheel on the rough areas to smooth them out. Any liquid present needs to be wiped away and oil cleansers need to have time to dry completely. Remember, even though steel is not as porous as cast iron, it can still absorb liquids so you will want to make absolutely sure the area to be mended is dry and free of flammable cleaners used to remove paint or oil. **THIS IS VERY IMPORTANT!! Once the area is prepped you may apply the acid we provided with your purchase. You will only need to use a few drops per our instructions. Use of flux is recommended but not required. Like with cast iron, the chances of contamination and oxidation is reduced in your repair when using flux so we always suggest that you take that extra step. Part 1: How to guide, cleaning focuses on Alumaloy to repair aluminum. Part 2: How to guide, cleaning focuses on Castaloy to repair cast iron. Part 3: How to guide, cleaning focuses on Steelaloy to repair stainless steel. We hope these cleaning guidelines have been helpful to you in the use of our products. If you have questions or comments please feel free to visit our stainless steel repair forum or post your comments directory to this article. Feedback always helps us to serve our customers better.